Duradek has been installed by trained professional applicators on millions of square feet of flat roofs, sundecks and balconies all over North America, which is where it is manufactured. Regardless of climates, Duradek has solved difficult waterproofing problems. Duradek can solve your exterior waterproofing needs with their proven system, installation techniques and experience. The Waterproof Vinyl Roof & Walking Deck Membrane System comes with a 10 year manufacturers warranty and can be used on sundecks, roof decks, balconies and other areas. It is available in many stylish colours, patterns and textures and offers a permanent waterproof protection. 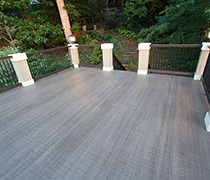 All Duradek sheet vinyl is designed for strength, stability and slip-resistance. Duradek recognized the need for a better method of waterproofing, because property owners and builders complained about leaks, unsightly appearance, expensive repairs and time-consuming maintenance on the ever failing old method of applied liquid and concrete topping products. All products designed for exterior use will eventually be affected by natural elements. PVC, which is man’s best attempt at prolonging the life cycle of various building products, delays the inevitable, but it will, however show some signs of degradation. After a period of years, UV (ultra violet) rays may affect outdoor products, so manufacturers add UV screens and stabilizers to prolong the life of PVC (vinyl) materials. These screens are designed to resist the cracking, embrittlement and discoloration of the vinyl. Therefore, the thicker the vinyl, the greater the resistance to degradation. The main function of the sheet vinyl product you purchase is to waterproof the space beneath, to protect the structure from rot, eliminate maintenance and to provide a durable long lasting, skid resistant surface. Although its ability to provide waterproofing is not affected, its appearance over time will eventually deteriorate. Generally, the lighter the color applied, the cooler the surface will stay and the less deterioration will occur. Darker colors will fade faster and be warmer on the feet. All vinyl tends to ‘yellow’ slightly. Gray’s show it the most, while the ‘yellowing’ is hidden within earth-toned colours. Products applied that have higher contrast in the print may show signs of fading sooner than low contrast colors. Solid colors will resist the visible effects of the UV the longest, however high contrast in the print helps to hide blemishes in the floor surface beneath, as well as the effects from everyday use. The lower the contrast in colors, the more these blemishes and the dirt will show. Solid color products are the most unforgiving. Simple and common blemishes such as plywood seams, nail head depressions or even plywood grain patterns can show up in late evening or early morning sunshine shadows. Sheet vinyls can be painted with a specially formulated coating, if an appearance change is desired. The emboss texture will be preserved but any print will obviously be replaced by a solid color. With our 30-plus years of experience, Duradek membranes are designed with proven blends of color, print and texture which offer the most long-lasting performance the industry can offer. SEAMS: The method we use to weld the vinyl sheets together is what makes our system so strong. The vinyl sheets are overlapped and heat fused. Other systems that previously offered invisible seams were not watertight. SCUFFING: If abused, just like any other floor surface, vinyl may scuff. Avoid dragging heavy objects over unprotected PVC. Anything that creates friction, with the extreme heat and abrasion may possibly remove the print. Duradek products are manufactured with a solid ‘base’ color, which is complementary, rather than obtrusive if the print finish is removed. Normal traffic will not damage the vinyl at all. Solid color membranes are available for high traffic areas.